L'impact parodique de l'ensemble est toutefois limité par la mise en scène inégale de Patrick Hugues, nettement plus à l'aise dans les scènes d'action que dans les moments d'humour. 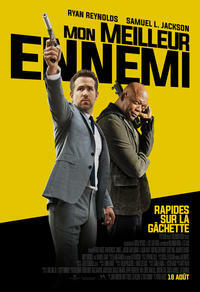 C'est une escalade d'humour et d'action que nous propose Patrick Hughes, le réalisateur de The Hitman's Bodyguard, dans cette comédie policière estivale. A-list action-comedy about a man hired to protect a professional killer is good showcase for its star – and nothing else. While not an ace action movie, The Hitman's Bodyguard does have its moments, and the stars more or less make it work consistently. Two charming stars and one canal boat chase aren’t enough to distinguish this Euro-set action-comedy. The Hitman's Bodyguard offers more than enough shoot-'em-up to keep multiplex auds munching their popcorn, but sharper talents behind the camera might have made it considerably more enjoyable. Ryan Reynolds and Samuel L. Jackson's foul-mouthed chemistry makes this high-concept action comedy a pleasant late-summer surprise.